FRA 2005 assessed all types of forests - from boreal and temperate forests to arid zone woodlands and tropical rain forests, and from undisturbed primary forests to forests managed and used for a variety of purposes, including plantation forests. On a global average, more than one-third of all forests are primary forests (defined as forests of native species where there are no clearly visible indications of human activities and where the ecological processes are not significantly disturbed). 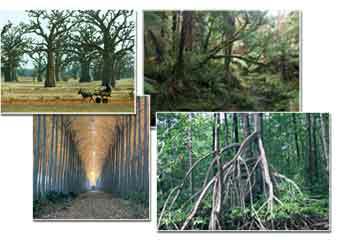 The rapid decrease of primary forest area reported for the 1990s continued in 2000-2005. This decrease stems not only from deforestation, but also from modification of forests due to selective logging and other human interventions. A number of countries registered positive change rates in the area of primary forests, including several European countries and Japan. This is possible because forests with no human interventions can evolve over time to meet the definition of primary forests used in FRA 2005. Forests and trees are being planted for many purposes and at increasing rates. Plantation forests - a subset of planted forests defined as those consisting primarily of introduced species - make up an estimated 3.8 percent of the total forest area, or 140 million hectares. Productive plantations, primarily established for wood and fibre production, account for 78 percent of the plantation forests, and protective plantations, primarily established for conservation of soil and water, for 22 percent. 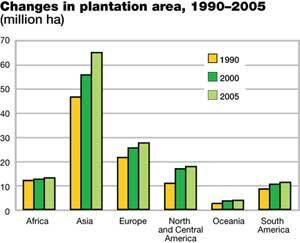 The area of plantation forests has increased by about 2.8 million hectares per year during 2000-2005, 87 percent of which are productive plantations. Despite the large number of native tree species in many countries, relatively few tree species account for most of the standing wood volume. In most regions and subregions, the ten most common tree species (by volume) account for more than 50 percent of the total wood volume. 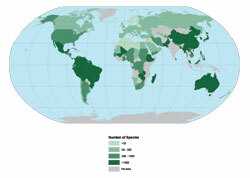 Exceptions are West and Central Africa, South and Southeast Asia and Central America, where the tree species diversity is particularly high. Rare tree species and those highly valued for wood or non-wood forest products (NWFPs) are often in danger of becoming extinct within parts of their range. On average, 5 percent of the tree species native to a country are either vulnerable, endangered or critically endangered.